Since 1875, Liberty has pioneered creativity within the world of textile design, through original and innovative seasonal collections from the paisleys of the 1890s to the digital prints of the 21st century. With new and classic designs added each season, the rich heritage of Liberty print continues, inspired by both classic archive designs, collaborations with visionary artists and original Liberty Design Studio work. The collection has been inspired by the British landscape architect William Nesfield, a major influence on garden design during the 19th century. He introduced balance between natural wildlife and symmetrical structure. His imaginative approach in evoking the serenity of a classic English garden encouraged Liberty Art Fabrics to create a collection of designs celebrating botanical beauty and craftsmanship. 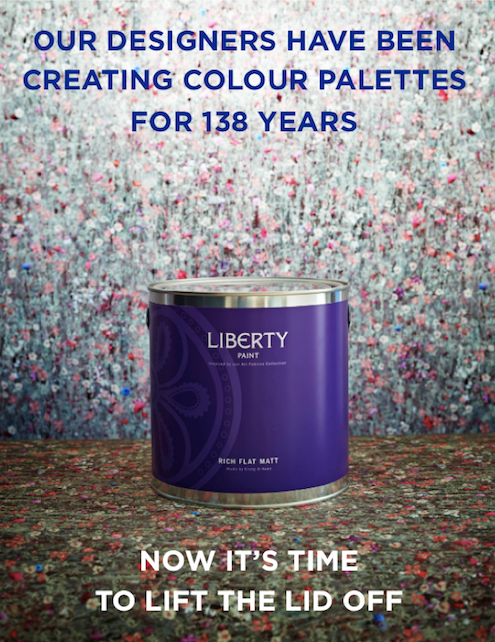 In support of the launch BrandVoice advised on the brand licensing of Liberty Art Fabrics to create a complementary range of premium paint working with the Liberty design team to create four collections designed to work with the fabrics. Liberty’s signature style of combining print and colour is at the heart of the collection. Design detail and vibrant colour palettes are borrowed from Nesfield’s most famous English landscapes. Turquoise greens and soft fountain blues evoke Castle Howard’s cascading waterfall; the vibrant colours of exotic fruits and flowers found within Kew Garden’s is celebrated in the Patricia design; while subtle tones of fawn, moss and golden yellow remind us of the beauty of spacious English parklands. The premium quality paint range is available online at colourandpaint.com in over 30 complementary shades. Liberty paints are sampled on the innovative iPatch – the intelligent way to test paint.